Gold Testing Machines for Jewellery Retail Stores : XAN 215 is uniquely designed and developed as an entry-level X-ray fluorescence measuring instrument which is used for fast and non-destructive analysis and coating thickness measurement of gold, silver alloys. It is also applicable while conducting non-destructive analysis of jewellery, coins and precious metals. These are also useful for the analysis of precious metals and their alloys in composition and coating thickness and up to 24 elements in the range of chlorine (17) to uranium (92) can be determined simultaneously. Our gold testing machine in assaying centres: XAN 215 is acclaimed for outstanding accuracy and long-term stability. These are extensively acknowledged for their time saving property and longer service life. These are fitted with the modern silicon PIN detector which achieves high accuracy and good detection sensitivity. These are widely known as a user-friendly bench-top instrument with quick and easy specimen positioning. These are designed in such a way that its X-ray source and semiconductor detector assembly is located in the instrument‘s lower chamber, which ensure that the measuring direction is from underneath the sample, which is supported by a transparent window. These provide precise measuring spot adjustment as these are fitted with the integrated video-microscope with zoom and crosshairs simplifies sample place. Our machines are directed through powerful and user-friendly WinFTM® software for the entire operation and evaluation of measurements as well as the clear presentation. Our devices are Fully protected instrument with type approval according to the German regulations „Deutsche Röntgenverordnung-röv“ and designed as per DIN ISO 3497 and ASTM B 568 standard. 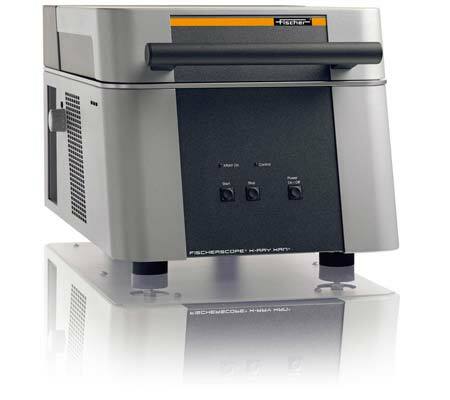 Intended use:Energy dispersive X-ray measuring instrument (EDXRF) to analyze precious metals and their alloys in composition and coating thickness.